Angelina Jolie bought her adopted son Maddox a bagful of books at Borders in Chicago, last Sunday. After playing games on his recent birthday, Maddox will probably spend the days ahead soaking up with books and he looks pretty excited with the prospect. 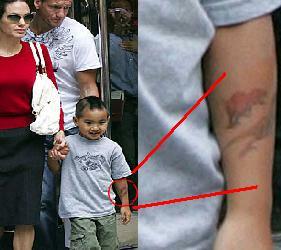 Maddox, like his mother, was seen sporting a tattoo on his right arm. The pattern on his tattoo seem unrecognizable, it is a good thing that his tattoo is just a cartoon tattoo that could be easily removed with soap and water.